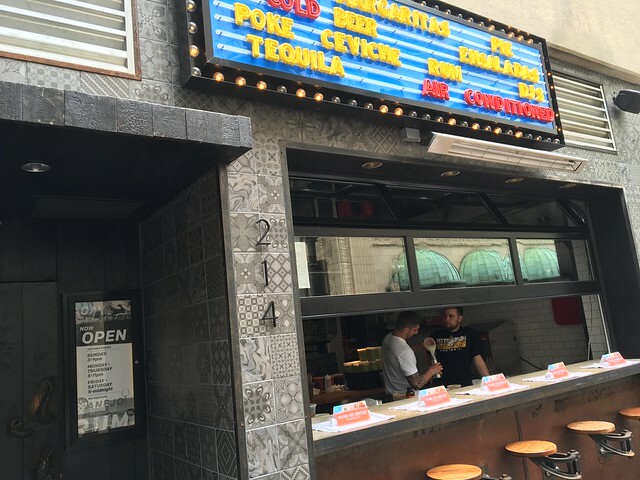 "Three gringos and an 8-legged culinary muse, who goes by the street name täkō, have brought the so-cal surf vibe to the Steel City with south of the border force and fierce margaritas." 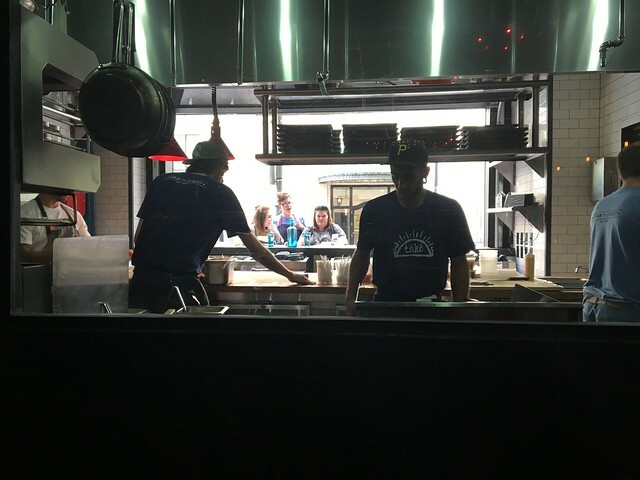 It hit me that I didn't have reservations for dinner during my day in Pittsburgh, so I texted a friend really quickly about whether or not that would be a problem for the two restaurants in particular I had in mind: Tako and Butcher & the Rye. His response was basically, if you're not already in line waiting for Tako to open up, you're not gonna get a seat without reservations. Challenge accepted. 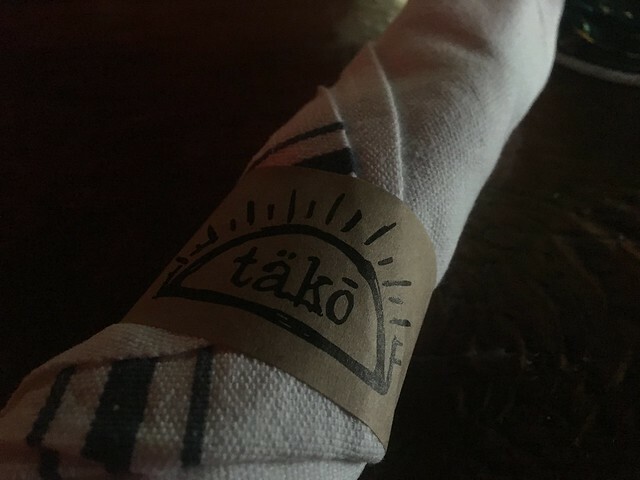 After drinks at Hofbrauhaus, we rushed across town, found a nearby parking garage and got to Tako at 4:20 p.m. That's 40 minutes before the restaurant opens. We stood outside the door, and slowly a line started to form behind us. By 5 p.m., there were a solid 20 people standing behind us on a Friday night waiting to get into the coveted late-night taco stand. 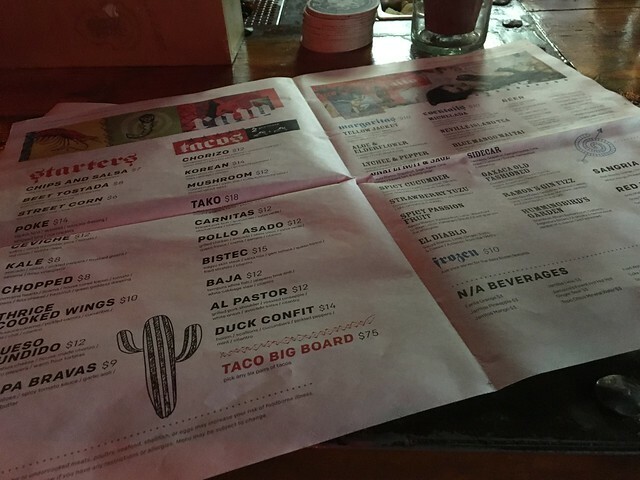 Tako has a few slide-out bar stools on the street that face into the restaurant. Perfect, I thought. We're first in line, so we can easily get the best bar seats (good lighting). No can do. Some reporter of some sort and her crew took up those spots. But, as soon as the door opens, we went inside, and they told us the first available slot would be 6:30 p.m.; I then asked if we could just sit at the bar. Oh, yes, she said. 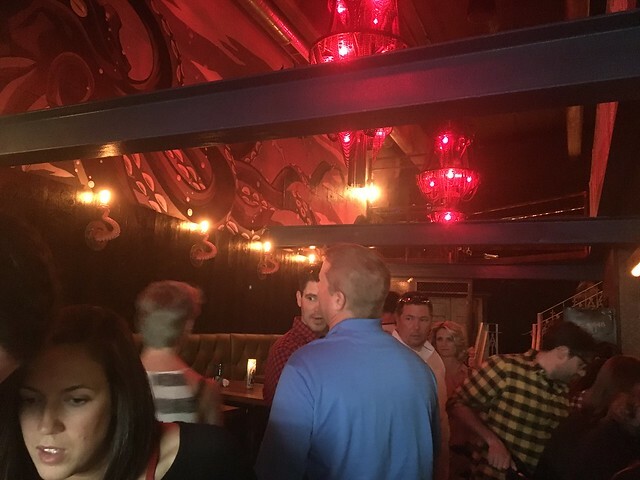 So, we sat at the closest bar stools to the kitchen, giving me the best chance for any sort of lighting in there since everything is red. It's loud, and it's busy, and as soon as we were seated, there were people standing behind us waiting for our seats. I ended up ordered a Korean taco (wagyu shirt rib, peanuts, fermented cucumber, napa cabbage and cilantro). Heather got the pollo asado (grilled chicken, avocado, white onion, salsa verde, queso fresco, crema, serrano and cilantro). Each comes with two tacos - homemade tortillas - overstuffed with ingredients. Heather called her tacos life-changing, and I have to say I had some envy. 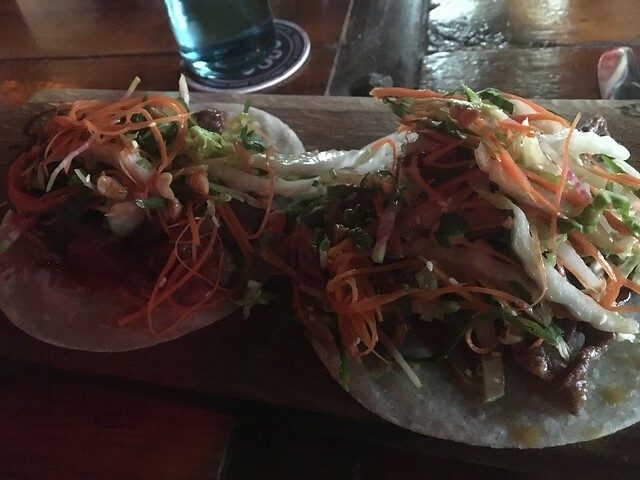 Meanwhile, my Korean tacos were very good. I loved the fresh, crunchy toppings and the sweet/spicy sauce enveloping the tender short rib. I love being able to see the chefs hand-making fresh tortillas, piling on incredible ingredients and delivering it to me just after the last garnish touches the top. My lips were on fire after scarfing down the first taco, but that didn't stop me from diving into the second. I do think the environment is a little crazy. I felt rushed the whole time, and it's not easy to hear your dining companion. And my taco was tasty, but it wasn't a foodgasm. Heather, however, may disagree.